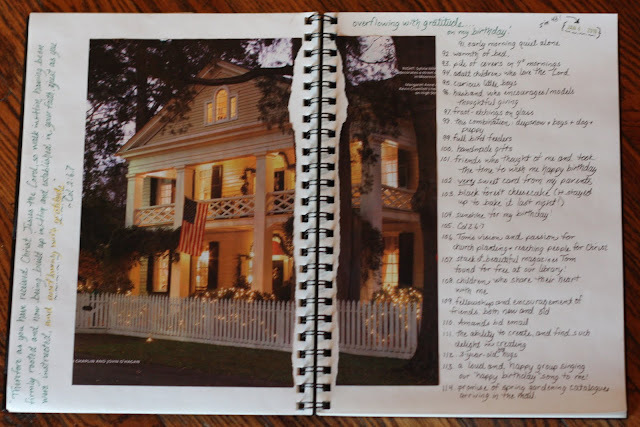 joyfulmomofmany: Remembering the Days...and a Giveaway too! ands down, the most satisfying new "habit" that I have made during the past year has been the decorated journals where I log my daily life. These are easy-peasy and give me not only the delight in looking back on what was on my heart at any given time, but also are an inexpensive piece of beauty on my desk. These are simple artists hard-bound sketch books, decorated with pictures I've rescued from old magazines and artwork from cards, embellished with pens, rubber stamps and odd doodles. I have two of these notebooks right now. One I keep open on my desk with current "to-do lists." The other is my thankfulness journal, containing an ongoing list of things I am thankful for. 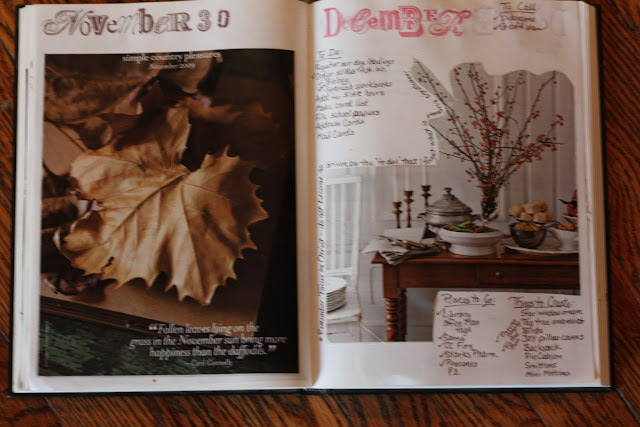 There is certainly no rule stating that you couldn't combine both a thankfulness list and a desk journal into one book. I have considered doing just that and may in the future. are the most meaningful to me also include quotes that I found (or heard around here), Bible verses on my heart at the time, poems, etc. My thankfulness journal simply contains an ongoing list of blessings found. Purposefully adding to this list has brought about an attitude transformation in me. My ordinary life is abundantly filled with grace-given gifts. And to think, if I hadn't begun to list, I never would have known! Next to spending time in God's Word each day, this would for sure be the daily habit that I would most recommend (ok I'd also have to add scripture memory!). The two journals that I am adding to right now are both about 8 1/2" x 11 1/2". One is spiral bound and the other is not. The advantage of the spiral bound one is that it can handle more bulk if lots of papers are pasted in it. The advantage of the other journal is that when the pages are open there isn't a gap between the pages. I have found lots of magazines for free... some at our library as it periodically (witty, huh?!!) gets rid of old magazines, my sweet mother has passed many along to me and I've even seen some listed for free on Craig's List. 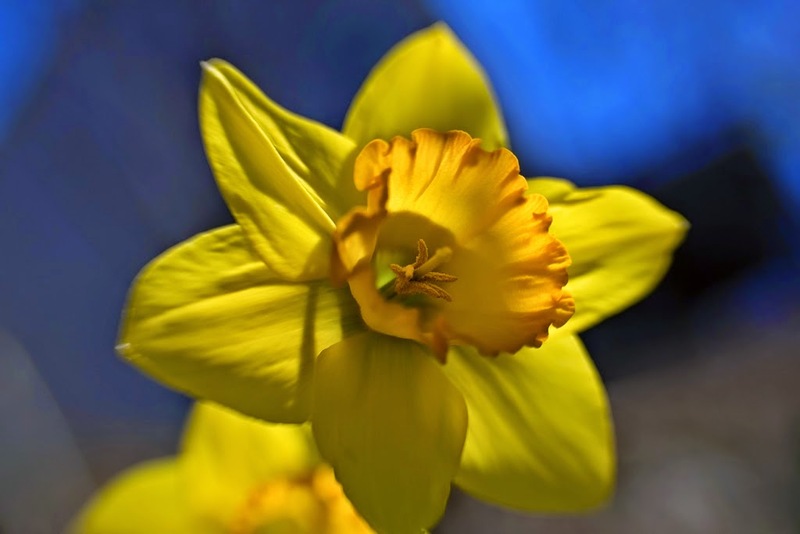 Some favorites: Country Living, Cottage Living, Country Living Gardens, and even ones like the Missouri Conservationist or Arizona Highways. When I am given a new magazine I try to go through it pretty quickly, tearing or cutting out pictures and words that appeal to me, then filing them into labeled folders. Some of the folders I use are: Spring, Summer, Fall, Winter, White, Pink (Valentine's Day), Floral/Gardening, etc. 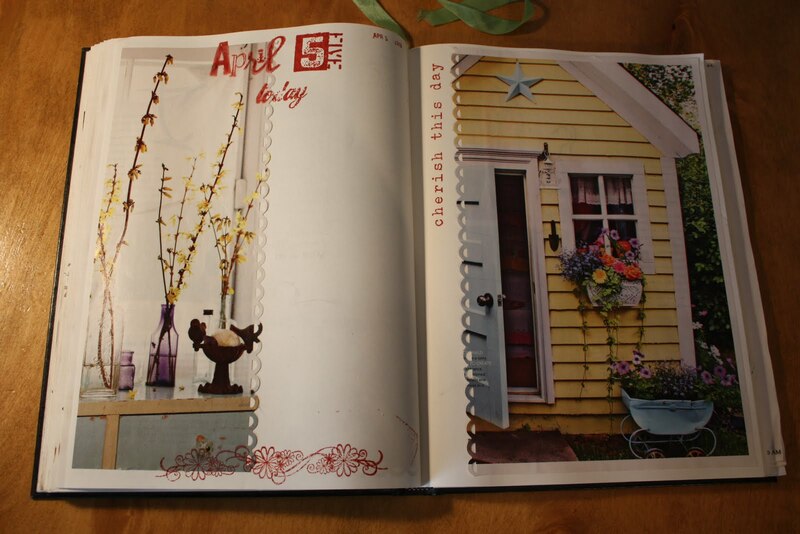 Then when I am ready to create a new page, it is easy to pull out my folders and go to work. I like to choose one or two colors from a favorite picture and include other pictures with those colors as well... I think it adds cohesiveness to the page. Lots of unrelated (by color) but favorite images are pleasing as well though. And now the giveaway! I'm so excited! This will be the first giveaway that I've done here on my blog and I am really looking forward to blessing someone with one of these journals! Just leave a comment here on this post and next Wednesday (May 5, 2010) I will randomly choose a winner. 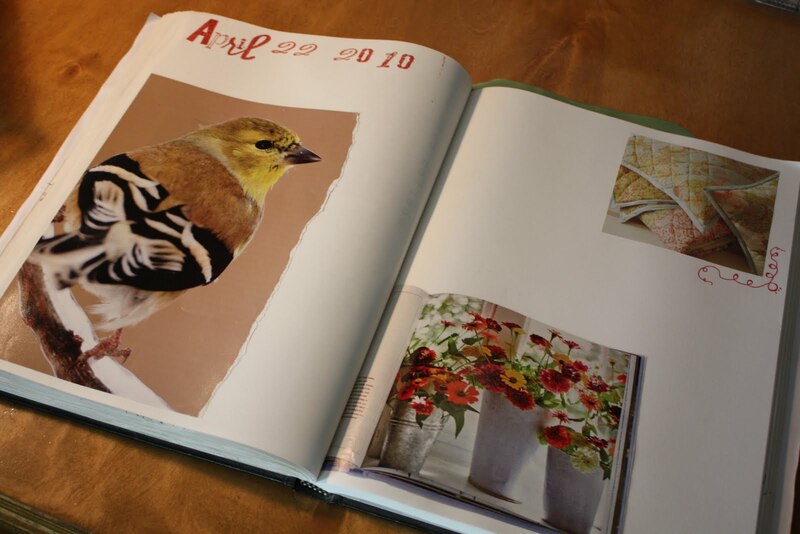 The recipient will receive a hard bound artist's journal with several pages already decorated and ready to receive your handwritten thoughts, lists and quotes. Such fun! If you are reading this on Facebook, you'll need to come to my actual blog to leave a comment if you want to be entered in the drawing, ok? So there you have it! Hope this is helpful. I know that these decorated journals have really enriched my days here. Your journals are beautiful. Very inspiring! 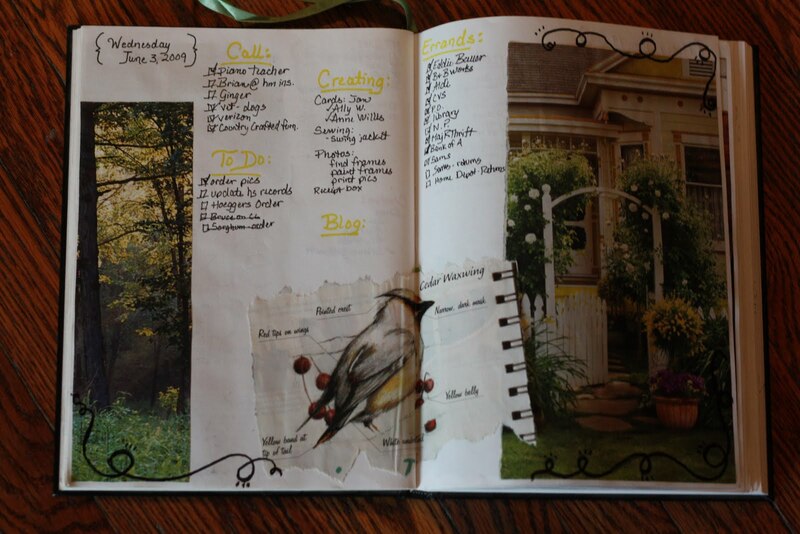 I've been thinking about doing a nature journal. I'm happy to have found your blog! Wow-very inspiring and do-able. What a great keepsake! Oh!!! 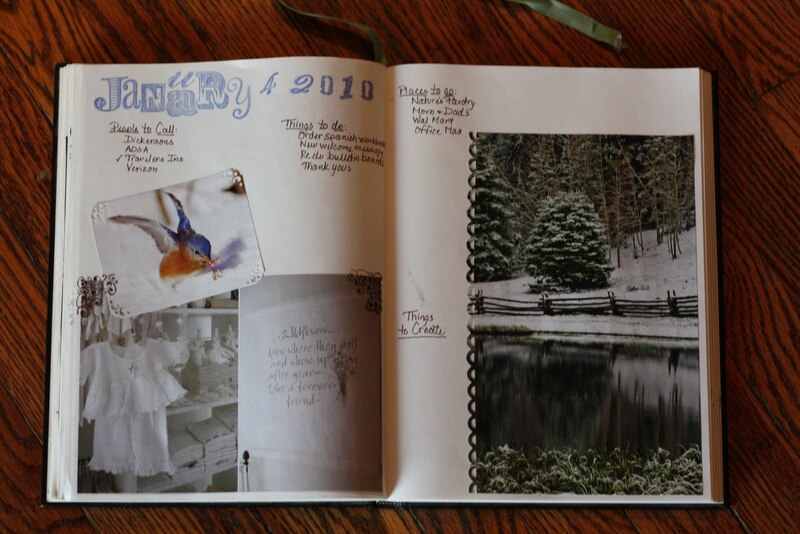 I LOVED getting to look into your journals like that! Thank you so much for sharing!!! You are so creative and I LOVE the way you added stamps...beautiful! I would love to be entered in your drawing! How fun! Thank you. 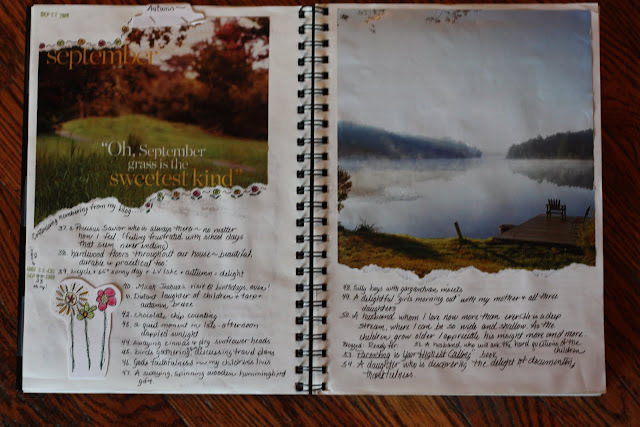 Okay now I am convinced that you and I are long lost sisters :-) I have journals like these. 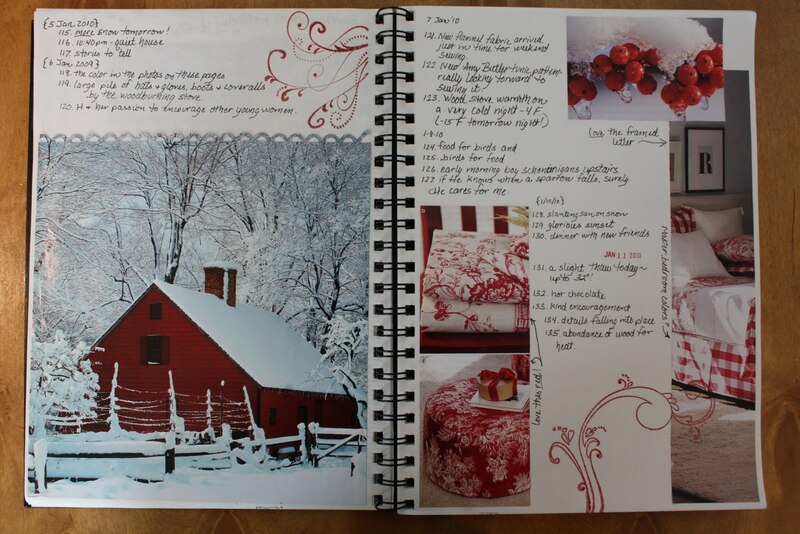 My most recent collection of pictures (from magazines too, also from the library and free) was put in a homemakers notebook. I picked favorite pictures expressing what each section of my notebook was teaching me, reminding me of, or encouraging me to do. I'm in! 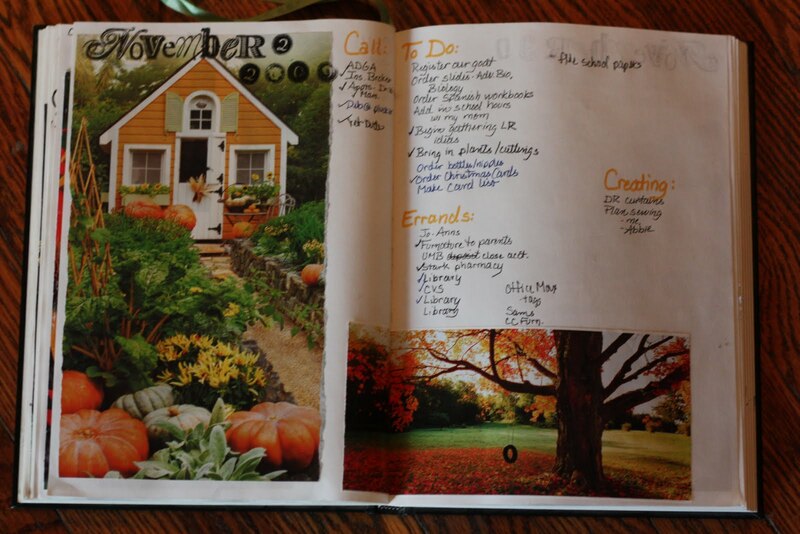 I have started my thankfulness journal, and I do keep a notebook of lists, but they are not very decorated!! Thanks for always inspiring me and being willing to share your creative ideas. Your journals are amazing. 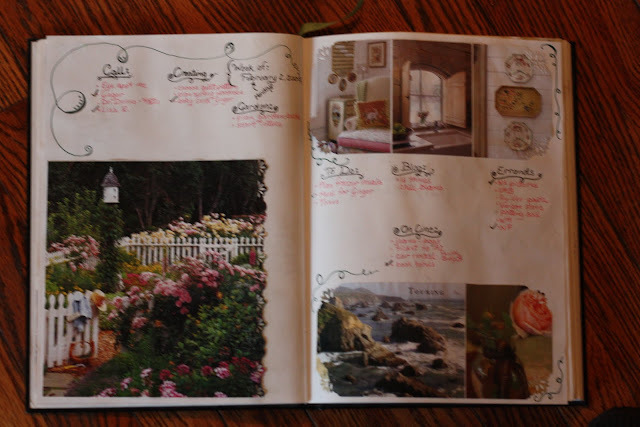 I would love to chronicle my daily happenings this way. How did you come about starting this, especially with all that you have going on in your home? Thanks for the inspiration and I would love to be entered into your drawing. I do this as well..I call it my memory journal. I have a planner I keep all my *to do* stuff in...but my memory journal, I decorate and then write in plans for the day...what did and didn't happen...the weather etc. :) So I can look back and remember! 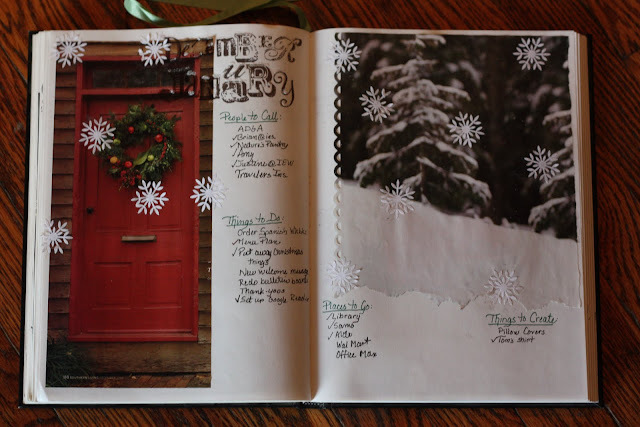 My journal is almost filled and I have been wanting to get a new one...so I would LOVE the chance to win this one!!!! Thank you for the chance!!!! Your journals are gorgeous! Such wonderful keepsakes for future generations. Wow. You are so awesome! What an excellent idea. 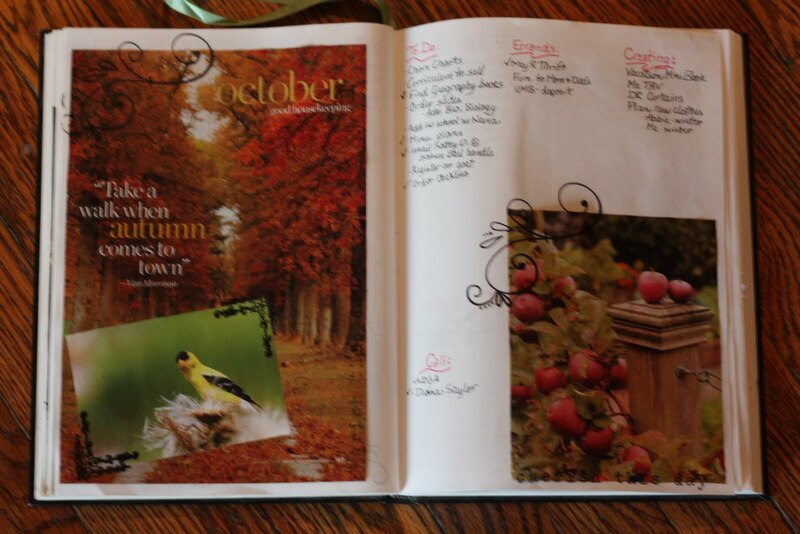 Using old magazines (recycling), and making memories in a simple inexpensive way (inciting thankfulness and beauty). 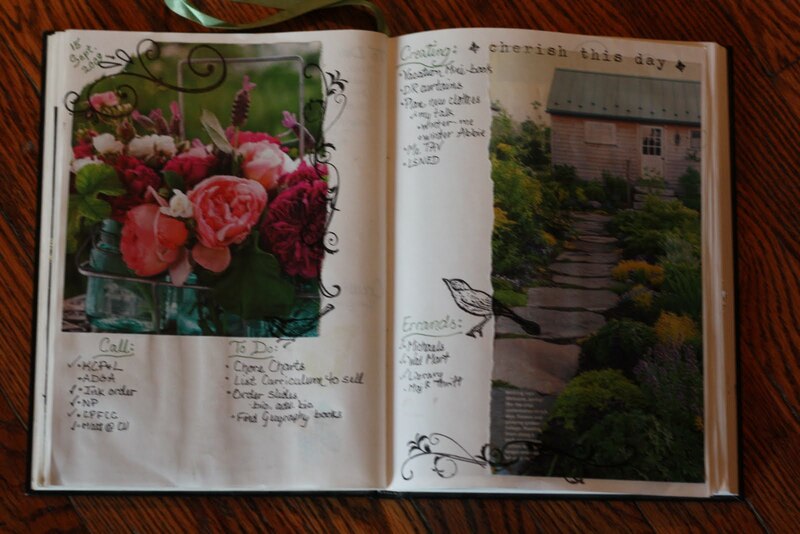 Your themes and added embellishments and doodles show such style. I think this is something I'd like to incorporate into a learning center. The kids and I can create the pages, learning to layout and smoothly paste in certain 'image areas'. Leaving it out is brilliant. Having a thankful area brings eternal value to it. Thank you Susan. I am inspired! Your journals are so clever. What a great way to combine things you love. I am learning to love journaling alot! That is why I enjoy looking at your blog with Mom! 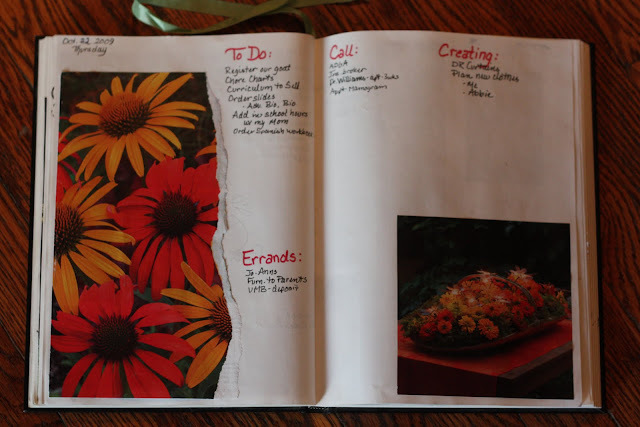 Your blog has helped me to learn how to creat MANY different things!You are a blessing to me and my life!This post gave me ALOT of ideas to put down in my own journals! Thank you alot for blessing so many people in so many different ways!God Bless you! Susan you have inspired me so much with this post!!!!!!! Absolutely gorgeous!!! What a precious keepsake to have for years to come. Please sign me up for this wonderful giveaway! I enjoy getting your posts. They make my heart smile! I love the pic's of your family and home. What a Beautiful, Inspiring Post! You are So Creative and Artsy! I don't know how you find time to create such practical, special, beautiful journals with your large family and busy life! 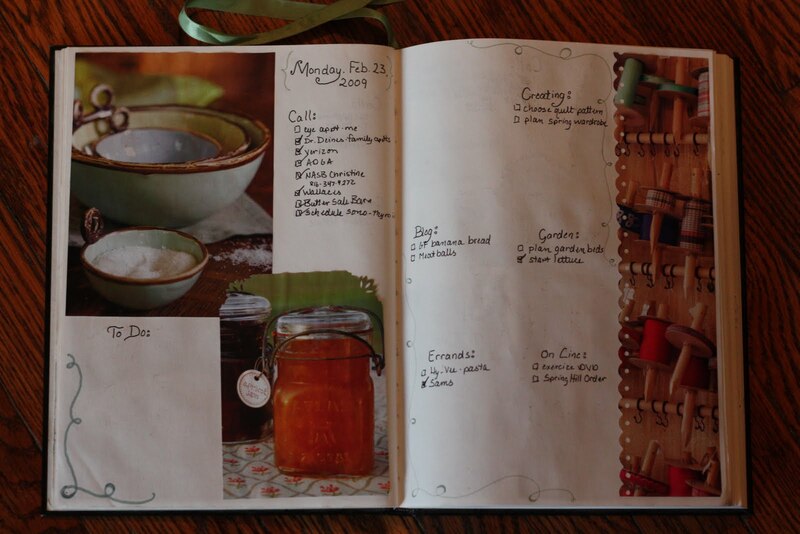 Thanks for sharing these glimpses into your life and journals! I am excited about your giveawaya and would love to win of these treasures. Susan!!! I think we are related! I do the same thing with my journal, except that I have combined them into one. AND I think we have some of the same pictures!!! I have photos that I have taken of mine and my children's ready for a post that I haven't gotten to yet, your post is great! I think I will just post my pictures and link them to your wonderful post! I like the hardbound journal, but like you mentioned, it is getting a bit think as I have added some ribbons for borders here and there, but so far so good. This is the first time I have left you a comment...although I have been a frequent visitor to your blog for some time. 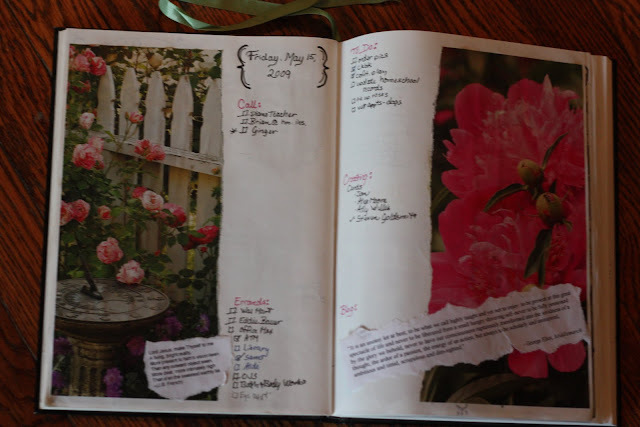 Your journals are beautiful and I would so love to be entered in your drawing. Thanks for your inspiration. I Love your journals! As a result, I started my own thankful journal at the beginning of this year (minus all of the doodles & pictures!) At this time in my life, I really need to focus on God's blessings rather than all of the bumps in the road! 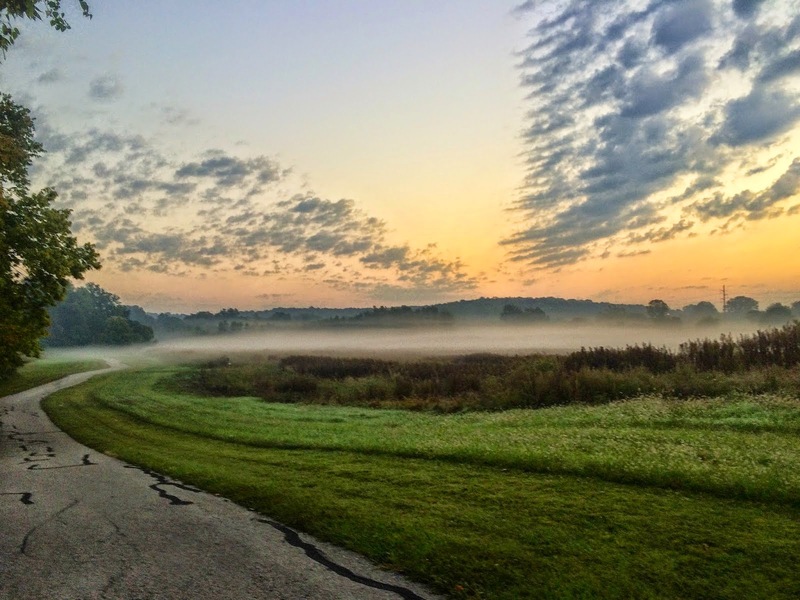 Thanks for your blog---it's so encouraging & visually inspiring! Susan, these are so inspiring! I feel like life gets so busy with little ones, but what a way to capture the blessings as the days fly by. Thank you, Friend! Susan, your blog never fails to inspire me and this post is no different. I started a thankfulness journal after reading one of your posts and I love it! I enjoy pasting pictures in it and then going back and reading what I've written. It's so encouraging. Thank you for all the time you take to post here. Wow! These are beautiful pieces of artwork. As I was reading through your post, I was saying to myself " How would I find time to make such a beautiful masterpiece?". Then I kept reading and I saw the giveaway. Awesome. Count me in. I have really enjoyed reading your blog and seeing your photographs. I am very humbled by your artistry!I would love to start one of these journals! You surprise me every tine I get an email. God bless you, Susan! As I was reading, I was so engrossed in the beautiful that I forgot about the giveaway. I actually thought, "I wish she could just make me one!" So I hope I win!! 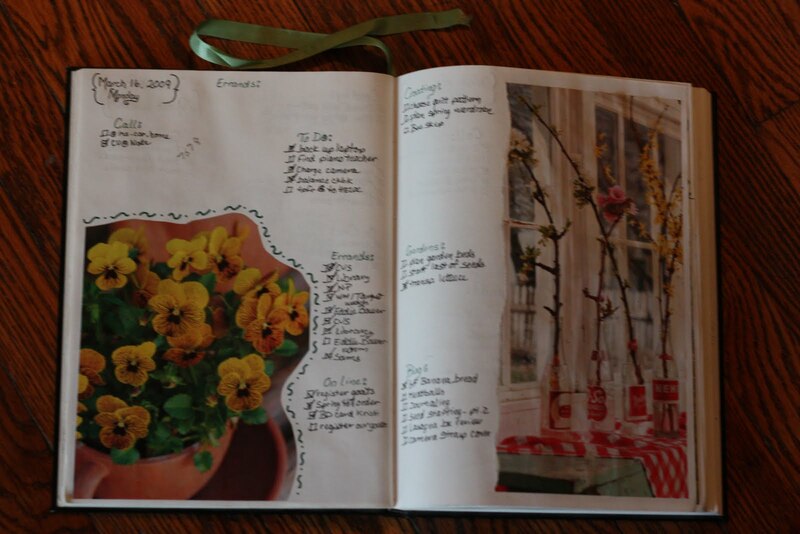 Susan, I loved seeing your journals. God has certainly gifted you in many creative ways. You are a blessing to so many. Writing about things I'm thankful for have give me a written record of God's faithfulness in my life. Thank you for your encouragement. These journals are beautiful! I really appreciate your blog. I just had my seventh child and your blog really encourages me. Thank you! I love the creativity in your journals, thank you for sharing them and your life through your blog. I love this...it's just like scrapbooking (a favorite pasttime of mine)! Count me in on the give-away. I'd love to get the kids around and make this part of our Art in homeschooling! Am new to your blog, but have enjoyed everything so far. Keep on posting! I just stumbled upon your blog and I'm sure it is not by accident. I am expecting my 6th child and love the encouragement from mothers of large families. 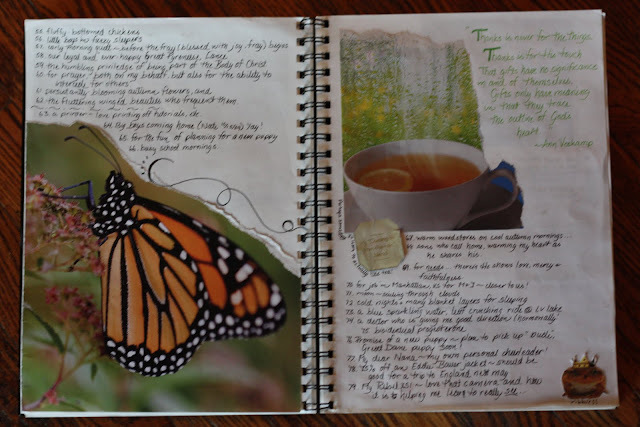 Your journals are creative and inspiring. 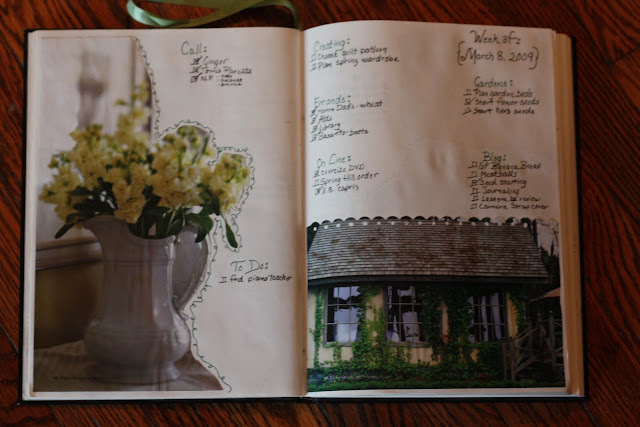 I haven't journaled for a while and miss the reward of looking back on them. What can I say that hasn't already been said by the others? Your journals are inspiring as are the things you share with us. I would love to win one especially since it was made by your lovely, creative hands. It has been way too long since I have been in touch with you. Things are just way too busy here with lots of different issue being dealt with. But I read your blog on a regular basis and you are in my thoughts more than you know. I found something the other day that you had written way back during our TODKAH days together. Finding it again was like finding a treaure! i am a regular reader of your blog and since have started keeping a grateful journal which really does keep you close to God and all that he has provided for us and blessed us with. 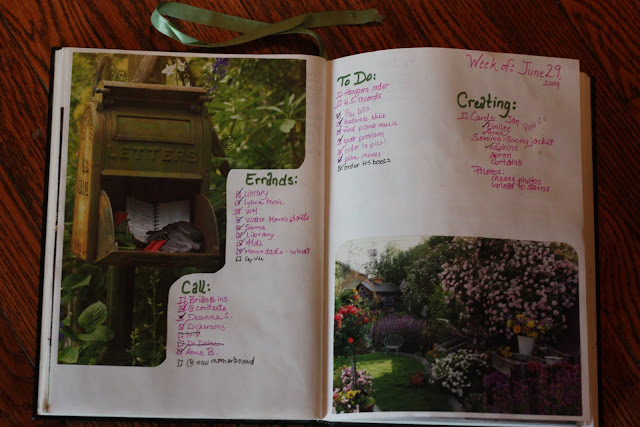 i really love your daily journal and all those lovely pictures - so lovely to look back on and see what happened on a certain day of a certain year - so much treasured memories of daily events easily forgotten - something i would love to take up. thankyou for allowing me to see inside and for the beautiful idea. We did call our library & yes, they are going to go through the mag's and she said..."Maggie can come & help her"! Wow, we are so excited! Thank you for your time on all of this and for shraring so much with so "many". those are just beautifully simple and inspirational! i would love one! These are just beautiful and so creative. I always tear things out of magazines but just put them in a plain folder to keep. I love love your idea so much better. How did you think of this? I would love to do this especially as I'm making my week in a life album. This alubm seem so much better than our other alubums do. This one has our thoughts, sayings, more "LIFE" in them. So now I know this is what I would love to start doing. You have done a wonderful job on them as always. So sweet of you to have a giveaway, thank you for a chance and just to show us your personal journals. My oldest turns "21" tomorrow so maybe I could start one and pass it on to her. Happy Mother's Day a little early, you deserve to rest and be pampered all day. Wonderful! These are artworks... that your children will cherish. It is so important not to lose the everyday, common memories. I would love to have a way of capturing them as you do. Wow! Your journals are so pretty! Please enter me in your give-away. This looks like such a fun thing to start doing! I live in England, so I don't know whether I would be able to enter the giveaway! Your journals are beautiful, and after reading about them here some months ago, I started a small one of my own, and it has become a treasured part of me - somewhere to record everything I am thankful for, and it also serves to remind me to think and search a little harder for the small things on days when things are not great. Thank you so much for the inspiration. These are absolutely beautiful and a wonderful idea. I'd love to win one as it would be an excellent way to document my upcoming student teaching! Your journal is absolutely beautiful. 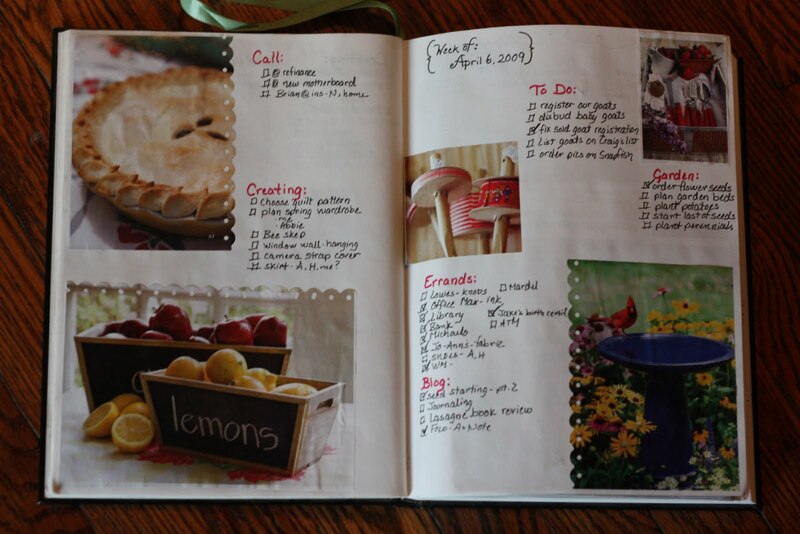 I love how you incorporate normal, everday lists in with such lovely pictures. Pretty Pretty Pretty!! I just love visiting your blog, your life seems so perfect to me!! I have 4 children and I really don;t know how you manage to do everything you do!! nd to have such happy looking kiddos, mine are always arguing!!! Please keep posting beutiful things for me to swoon over!! I've postponed my bedtime tonight distracted by your unique and inspiring blog ;-) This reminds me of the Titus 2 woman I aspire to be. Keep up the diligence and devotion to this encouraging ministry. 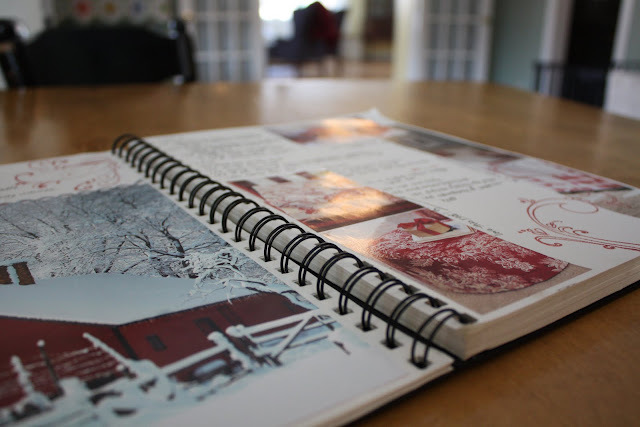 Your journals are beautiful and very inspiring just like your blog. I enjoy reading about your family and treasure the spiritual reminders that you share. Thank you for taking the time to share your life with us. Your journal is so beautiful and creative. This post has great ideas in it.